My name is Nadja M. Maldonado Luna. I am a second year Mechanical Engineering major at the University of Puerto Rico, Ponce Campus. From the moment, I decided to apply for this REU experience I knew that it was going to be an interesting adventure both academically and personally. I knew I was going to have to face some big challenges. The UPR system went on strike early April, so a summer internship would mean for me, to risk finishing my classes to be able to have an experience that would certainly benefit both my present as an undergraduate student and my future as a professional. So far, I’ve met amazing people, from my fellow REU mates and now friends, to my mentor and advisor. All these people have been making my summer a remarkable one. Halfway these ten-week program I can only say that it has put myself out of my comfort zone in many positive ways. I’ll start by explaining how new to me my summer research topic is. I’ve worked before in research topics within chemistry and engineering. But I’ve never found myself so overwhelmed by the amount of terminology and procedures I am not familiar with. 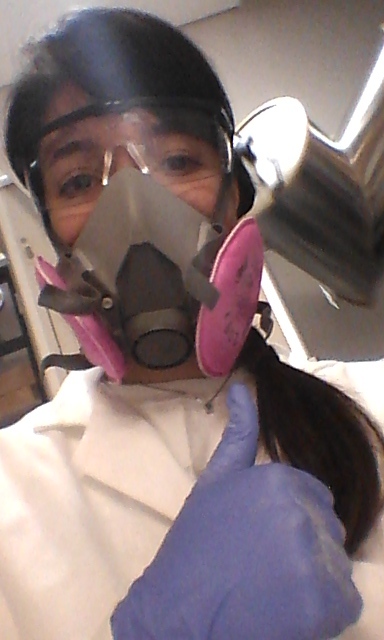 I am currently working in pharmaceutical engineering, my procedures involve working with a lot of powder ingredients, and first of, wearing a face mask respirator was never in my list of protective wear in the lab within the areas that I’ve worked before. I’ve learned so much, and it has only been five weeks. From material characterization techniques, I was not familiar with, to multivariate data analysis computer tools and techniques. It has been five weeks of intense training and learning. My mentor has also contributed largely to making my transition to this new topic a smooth and exciting one. He has been an extremely accessible person, always willing to clarify any doubts that I may have, and to help during the process. And so, I could not be more pleased with my learning research experience so far, but I am even more excited for what’s to come. Regarding a cultural experience through the REU, I thought that it would not have such a great impact on me, I was born and raised here. I’ve seen most of the island and experienced most of its cultural richness. But, my REU friends, that come from other states and have never visited Puerto Rico, have helped me see Puerto Rico with different eyes, they have shown me a new appreciation for my culture, our food, and just about everything this small island has to offer, to us who live here, and to those who just come to visit. I have also learned much about Colombia. You may ask how or why is this; well it is mostly because of the graduate students that work at the pharmaceutical chemistry laboratory. Most them are from Colombia, including my mentor, who sometimes pop quizzes me on Colombian culture. Colombians are much like us, there music is very vivid, they are happy people who always offer you a smile and a warm greeting when you come into the lab. Working there has also been unique and pleasant. To finish, this summer has been one of great challenges, between trying to finish classes back at my university by self-teaching me the courses, studying for exams and traveling back to Ponce to take them, and conducting full time research, my hands have been quite full. But without doubts, I would not trade it for anything else. I can’t wait for what will come next out of this Powder-ful Summer Experience.